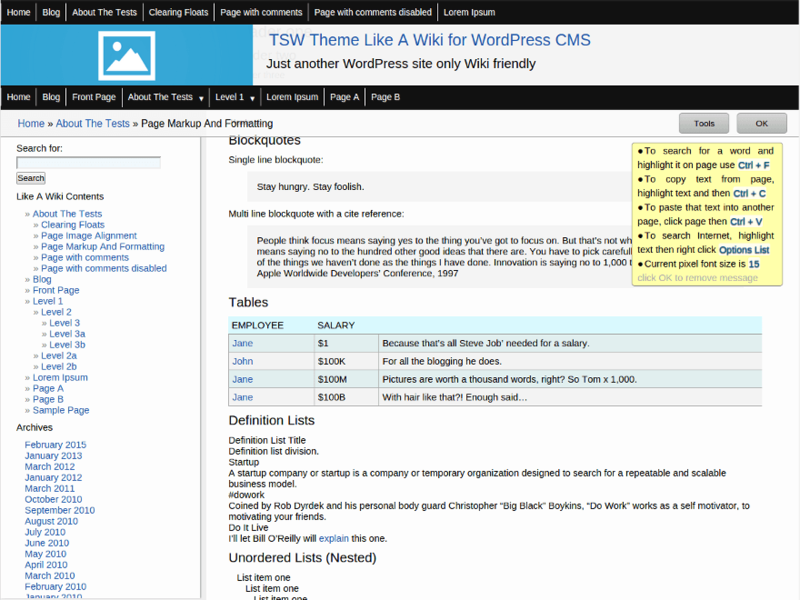 TSW Theme, Like A Wiki, looks like a wiki and has a wiki-type functionality. Theme options for admins include: Set font size, from 9 pixels to 25; Select color of links to your preference; Set header image. Front end has a scrollable sidebar which is the pages menu, by default and displays the pages in hierarchy. Alternatively you can add any WP widget you like. The two sections, left sidebar and right content, both scroll separately to help users navigate through sites with lots of content. Header is fixed with opacity to let content scroll visibly. Two menus are smooth acting pull-downs. Theme features a Toolbar that shows breadcrumb page trails and a user tool box.